This wonderful bread was inspired by a recipe from Neil, a professional gardener and chef from England. The recipe was from his Grandma. He says, "My Grandma was in service in a big house in North Yorkshire from 1911 till 1921. She started as a scullery maid and ended up as Head cook! Luckily she kept a diary of what she cooked and for who. She cooked for the King and Winston Churchill, amongst many others." 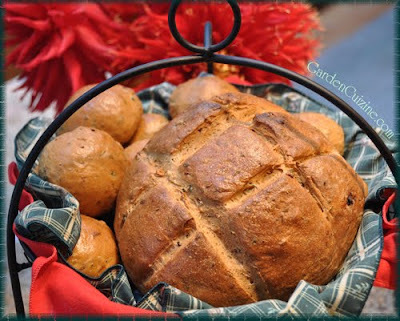 This herbal bread dough can yield dinner rolls, boules, or farmhouse loaves of bread. I divided the dough in half and made one round, free-form, boule loaf and the rest into dinner rolls. Neil likes to divide the dough in half and press the dough into loaf pans. The choice is up to you. Our finicky Mama prefers super soft, sweet dinner rolls made with eggs, milk and more sugar. But even she agreed that this bread was delicious! When you want a good, wholesome and tasty bread, try this recipe. Nothing beats the smell of fresh baking bread wafting throughout your home. This bread freezes well too. 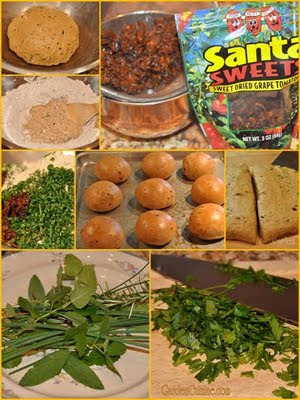 Notes: Fresh herbs can be substituted with dried herbs. Use less - around half of the amount called for - dried are more concentrated in flavor. As always, wash your hands and sanitize your counter tops before working with food. Prepare the herbs by washing, drying and chopping, set aside. Drain the soaked sun-dried tomatoes and save the liquid. Chop the hydrated tomatoes and set aside. In a large bowl, whisk together the flour, salt and sugar. Add in the prepared herbs, tomatoes and cheese. Whisk together to combine. Make a well in the center of the flour and add the oil, some of the water and tomato soaking liquid, and all the yeast mixture. Slowly incorporate into the flour using a wooden spoon. Gradually add the remaining liquid. You may need a bit more or less, use your judgment. With your hands or in a mixer with a dough hook, mix and knead the dough until it comes together in a smooth stretchable mass. Form the dough into a round ball and place in a large, lightly oiled, bowl to rise. Cover the bowl. I use a dampened linen cloth, some prefer to cover rising dough using plastic wrap. Allow the dough to double in size in a draft free warm place. Punch down and divide the dough in half. Allow the dough to rise again until the dough responds with a slow rebound when gently pressed with your finger. If desired, carefully brush the tops with egg wash before baking to give the bread a slight gloss. Neil adds a sprinkle of grated cheese and herbs to the top too. *Boules can also be placed on a piece of parchment or baking peel dusted with cornmeal or flour to rise, so they will easily slide into the preheated oven onto a baking stone or oven bottom. Advanced bakers also like to add steam at the onset of baking by squirting a light spray of water directly into the oven right after the bread is added. Bake until golden brown. Baking time will vary depending on your bread shape and size. Dinner rolls don't take too long, ~15 minutes. Loaves will take longer, ~30 minutes or more. I usually test for doneness by feeling the weight of the bread. Bread will feel lighter when it is fully baked. Some bakers test for doneness by listening for a hollow sound when tapping on the bottom of the loaf. Special Thanks: Special thanks to Neil for passing on his Grandma's recipe. My interpretation of her recipe is slightly different, but for the most part it is the same. I used wholegrain flour, added more liquid, and reduced the salt, since grated cheese adds sodium. For the original recipe, see Neils comment at the bottom of my Rosemary article under the post by NEILMUIR1. Thank you so much for the recipe. I put up several jars of sun-dried tomatoes (actually dehydrator 'maters, lol) this year and I'm now trying recipes to use them with. This bread recipe sounds like a real winner!! I'll let you know how it turns out. Hi Bev, when you dry your garden tomatoes, do you find particular cultivars work better than others? I would like to try it. Friends of ours swear by their dehydrator. I used Roma, little grape, and a medium sized heirloom slicing tomato called Ruth's Perfect (and it IS perfect). I sprinkled lightly with sea salt and coarse-ground black pepper. They all did very well. I seeded most of them, so they were tomato skeletons before the drying started. I believe next year I'll leave the seeds intact! The recipe for canning the "sun-dried" tomatoes called for briefly soaking the dried tomatoes in vinegar before layering with basil (I added a little garlic powder too) in the jars, then covering with olive oil. They smell heavenly, and I can use the oil with dressings, too.